Hidden in the isolated northwest corner of Nevada, lies Virgin Valley. Despite it's arid and desolate location, rockhounds and miners from all over the world travel here to search for the beautiful black opal for which this area is famous. These spectacular opals are prized by collectors, lapidary enthusiasts and jewelers worldwide. Click here for tips on Planning Your Trip. Virgin valley is a high desert region (an elevation of 5,000 to 6,000 ft.), located about 30 miles southwest of Denio in Humboldt County. 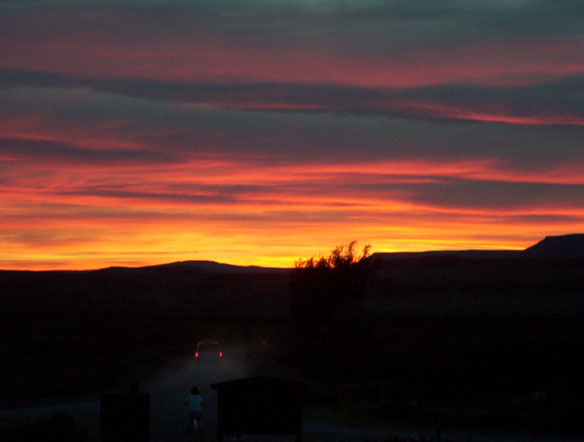 The area is teeming with wildlife, from wild burros and horses to antelope and jackrabbits. There are numerous hot springs dotting the land with their attendant lush vegetation, creating a series of oasis in the desert. This area is famous for the rare and fabulous black opal, known to occur in only two places on Earth: Virgin Valley, Nevada and New South Wales, Australia. These wonderful specimens flash and gleam with a rainbow of brilliant reds, blues, greens and purples in a jet black matrix. Prime examples can be worth more per carat than even diamonds. Click here for more Opal Facts. Most of the opal is in the form of replaced wood and limb casts. Sometimes retaining the characteristics of the ancient wood in incredible detail. It is theorized that this area was once the location of a large lake surrounded by lush forests of sequoia, spruce, hemlock, birch, cedar, larch and chestnut. This prehistoric forest was devastated by a series of volcanic eruptions which buried the forests, lakes and accumulated driftwood with layer upon layer of ash. Over millions of years, the silica-rich water of the areas hot springs seeped through the layers of ash and slowly replaced the buried wood with hydrated silica molecules. Under the right conditions, precious opal may form. Click here for Area Geology. Legend has it that a range rider, perhaps a Pony Express rider, found the first glistening piece when passing through the area in the early 1900's. 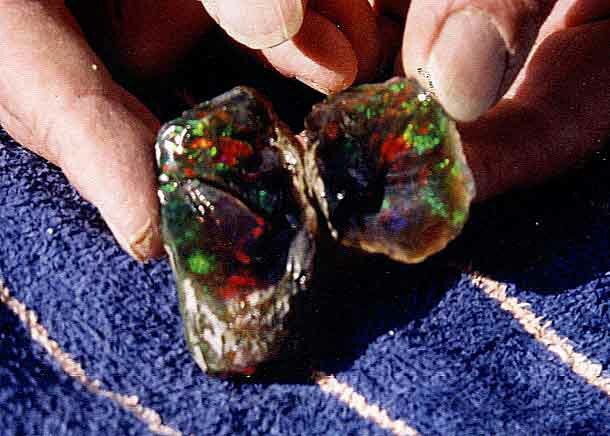 The discovery was widely reported by the press and within a few years several claims were staked in the area and commercial mining of Virgin Valley Opal began. 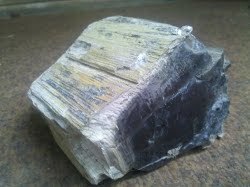 Some of these early mines still exist today. The Bonanza has been producing opal since 1905 and the Rainbow mine since 1911. Click here for Area History. Over time, Virgin Valley opal developed a reputation of being unstable and prone to cracking due to it's high water content. (Virgin Valley opal can be up to 14% water, where Australian opal may be as little as 5% water). Although many rockhounds keep their specimens in water to prevent this cracking, much Virgin Valley opal retains its brilliance and integrity for decades with no special care.